I really fancied huevos rancheros today, but as I'd already used my Hex B for my bacon butty at breakfast, I decided to substitute a thick slice of ham for the tortilla. The advantage of serving it with a cooked salsa rather than raw, is that I could add plenty of onion to really up that superfree. Husband requested chips, so I made him some black pepper jacket wedges. They're almost chips, and I can't be too compliant now can I? Par boil the potatoes, shake well in a sieve or colander to rough them up a bit, place on a baking sheet, sprinkle with salt and cracked black pepper. Cook in the oven on a high temperature until nicely brown. Meanwhile, make the salsa. Sauté the chopped onion, garlic and ginger in Fry Light until soft, then add the tomatoes. Continue cooking for a minute or two, then add the tomato purée and paprika. You may need to add some water if the mixture is too stiff. 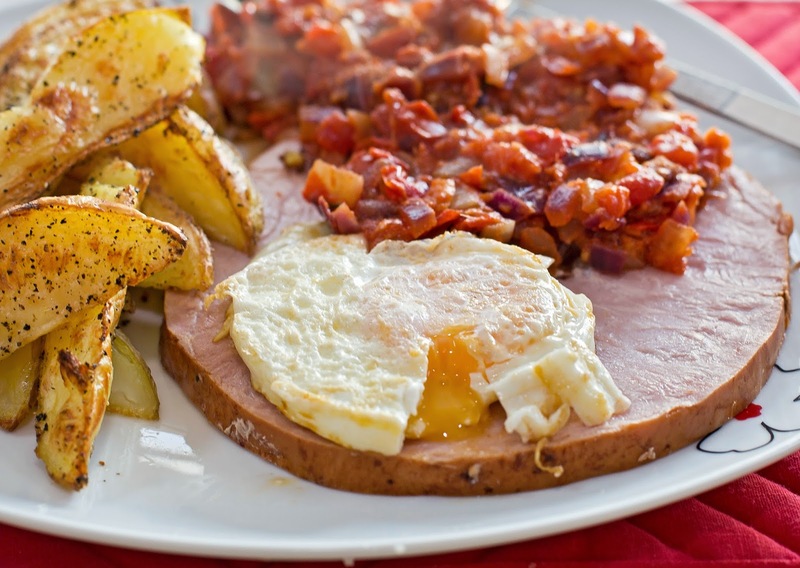 Serve with the ham and a fried egg.